The last thing you need this winter is damage to your roof. Dambuster Deicer products are a cost-effective solution for keeping ice away and your roof in great condition throughout the year. Icicles and freezing runoff may look beautiful—but often cause damage when water melts, refreezes, then expands creating "ice dams." 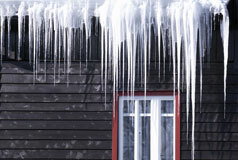 These "ice dams" cause water backup, leading to leaks, and damage to the roof, gutters, façade and interiors. So why do these ice dams form in the first place? When a fresh layer of snow covers your roof, the warmth from the house and varying temperatures will melt the snow and ice. Then, when temperatures drop the melt water refreezes and expands. The expansion causes cracks and fissures in your roof and can crack roof surfaces, ruin gutters, scuppers, roof flashing, drain boxes and downspouts. Dambuster roof deicers are the best solution. Avoid roof ice damage to your building or home. Call 1-844-DAMBUSTERS (1-844-326-2878, toll free). Please feel free to contact us regarding large volume orders. Download our free brochure and learn how our patented products and help your avoid winter ice damage. Learn how Dambuster Deicer products can prevent expensive water damage to your roof, home or building. Don't let ice and snow damage roofs this winter. Use Dambuster Deicers to prevent costly repairs. Dambuster Deicer products prevent winter ice from forming in your gutters or scuppers, drain boxes and downspouts. philadelphia web design and web development, vance bell.